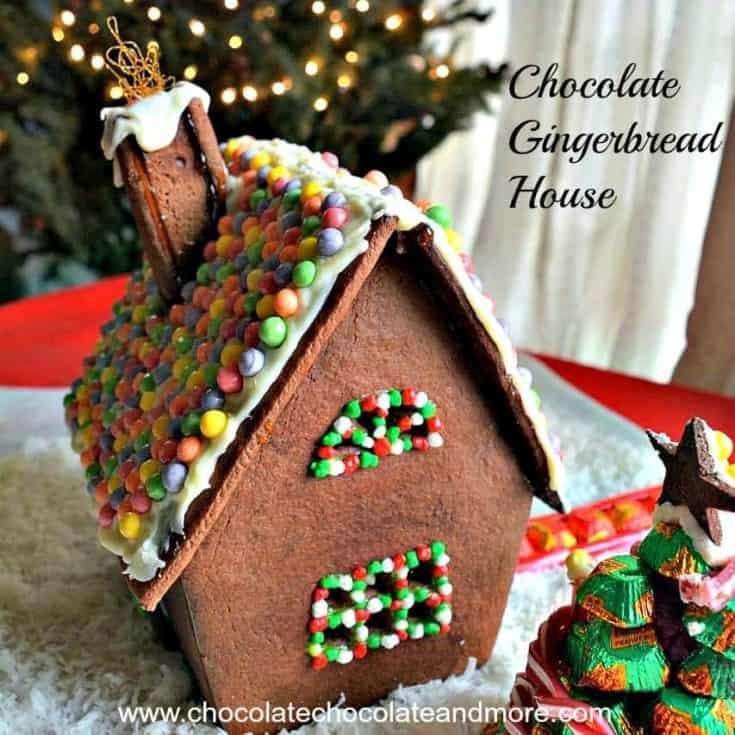 Chocolate Gingerbread House - Chocolate Chocolate and More! Gingerbread houses are a classic Christmas tradition. Our Chocolate Gingerbread House starts with Chocolate Springerle Cookie dough and features Nestlé candies. My daughter, Becky, has a December birthday. When she was little, we always tried to have a craft as part of her party. Sometimes it was just a little girl theme but often we did something for the holidays. We made gingerbread cookies one year. Each child got a small rolling pin and cookie cutter to take home along with their cookies. One of my more crazy ideas was making gingerbread houses from graham crackers. What could go wrong with single mom helping a bunch of elementary-aged kids assemble houses out of graham crackers, candy and copious amounts of frosting? There were a few that actually looked like houses and the kids had fun. 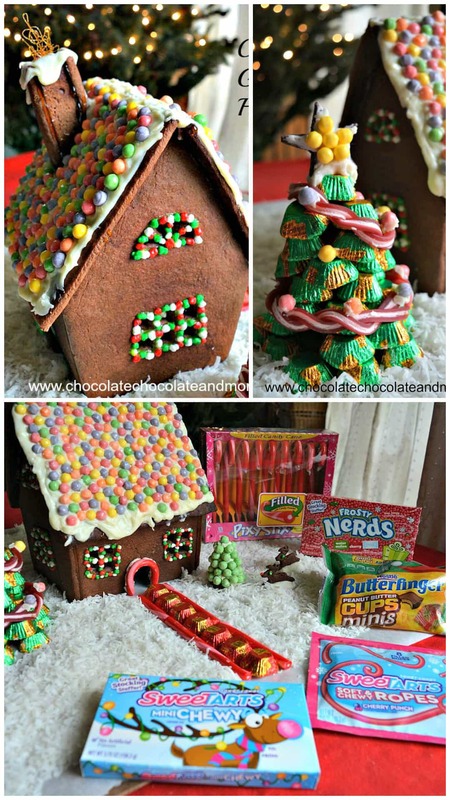 I was thinking of doing a chocolate twist on the traditional gingerbread house when Nestlé contacted me about doing a gingerbread house post. They have some great new candies that work so well with chocolate! 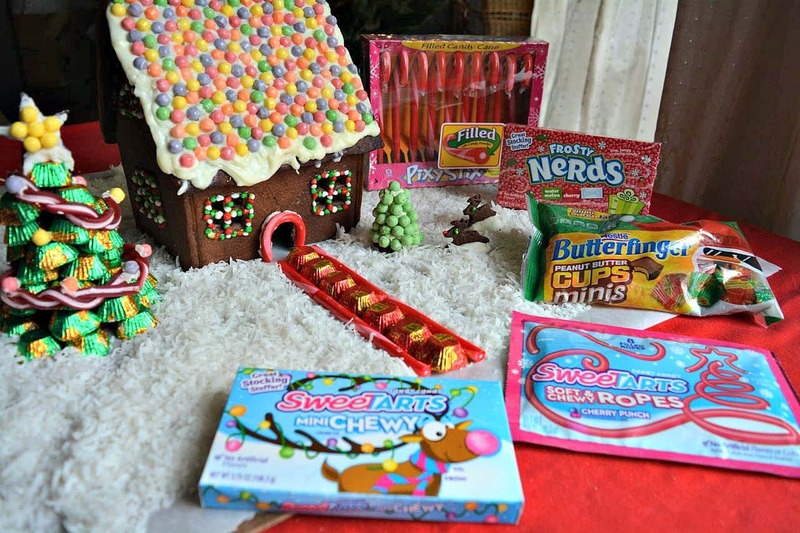 Nestlé sent me Butterfinger Peanut Butter Cups Minis, SweeTARTS soft and chewy ropes, SweeTARTS mini chewy, frosty nerds and Pixy Stix candy canes to decorate my chocolate gingerbread house. Of course I had to sample. The filling in the Butterfinger peanut butter cups minis is a mixture of peanut butter and crunchy Butterfinger bits. These festive red and green foil-wrapped goodies are ideal for gingerbread houses, stocking stuffers, candy dishes and baking. I used these for the path and Christmas tree. If you made a sleigh out of the candy canes, the Butterfinger peanut butter cups minis would be great presents. There’s a recipe for truffles on the back of the package that I’m definitely making if there are any left. I think they’d be great in muddy buddies too! SweeTARTS Soft & Chewy Ropes treat candy lovers to a soft, chewy, cherry-flavored licorice rope packed with a tart punch-flavored center. If you cut them in half lengthwise, you get a two-toned effect which is absolutely lovely. I twisted mine together to make the garland for my christmas tree. SweeTARTS Soft & Chewy Ropes have a gift tag printed directly on the package. I don’t know about your kids, but writing names on candy packages sure cut down on conflicts in our house. Even better, both SweeTARTS Soft & Chewy Ropes and Butterfinger Peanut Butter Cups Minis contain no artificial flavors and colors. 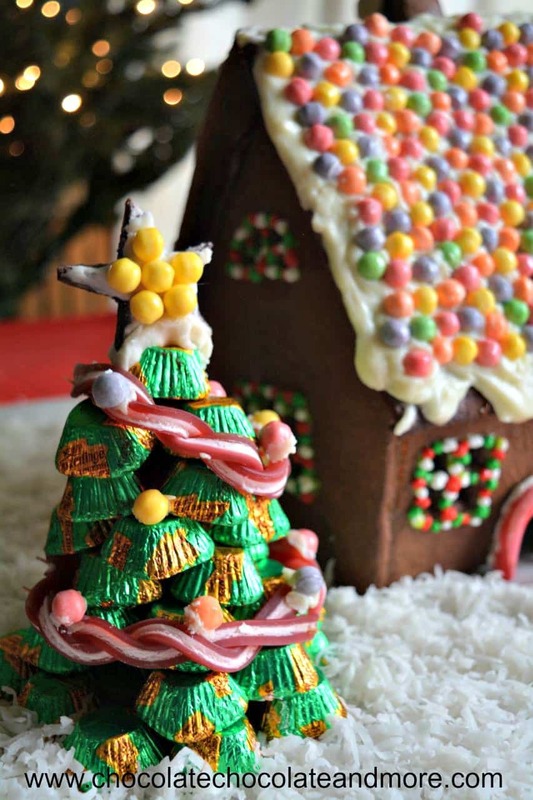 The SweeTARTS miny chewy candies taste like SweeTARTS from my childhood but they’re chewy and round – perfect for making and decorating trees on my house. I also used them for my roof. My kids’ favorite are the frosty nerds. I had to hide them – seriously. 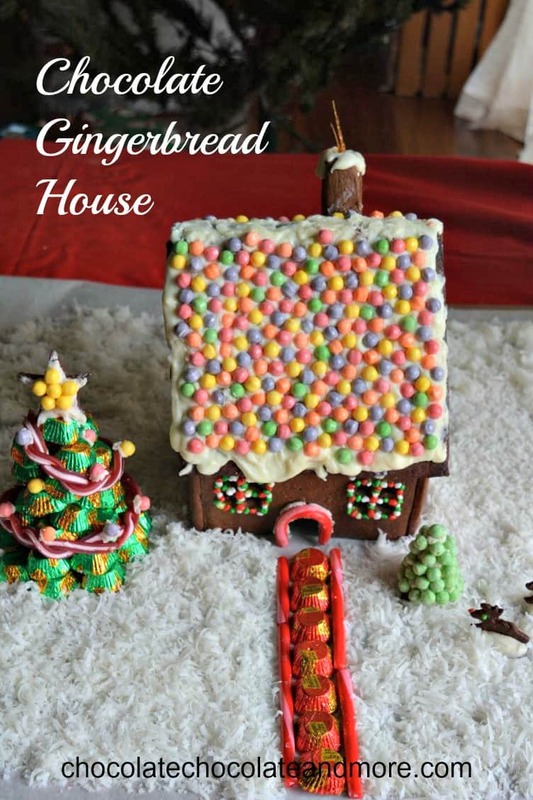 I love how you can use the different sizes for different parts of the gingerbread house. I surrounded my windows with larger ones and used the tiny ones for reindeer eyes, Rudolf’s nose and decorations on the back door. They’d also make fun sugar cookie decorations. Lastly, there are the pixy stix candy canes. These are tart candy canes filled with pixy stix powder. Genius if you ask me. The powder does not leak out when you break the candy canes but it adds great flavor and brings back memories and sharing with my grade school friends. I started with our chocolate Springerle cookie dough. One batch makes “just” enough dough for the chocolate gingerbread house pieces so if you want to be on the safe side, made an extra half batch. You can use the extra to make some cookies. I used Martha Stewart’s Swedish Gingerbread House template. In addition to the template pieces, you also need two 6.5 x 7.5 inch pieces for the roof. I put pan-sized sheets of parchment on my work surface and rolled my dough to 3/8″ thick. I cut my pieces out on the parchment leaving enough space between them for baking. Then I put the whole parchment sheet in my baking pan and baked at 375°F for 15 minutes. I also cooled them on the pan to dry them out a little. Drier cookies are more sturdy for gingerbread houses. I decorated my chocolate gingerbread house sides before putting the house together. It’s so much easier to decorate on a flat surface. I know a lot of people have issues with raw eggs so I opted for store bought gel, buttercream, and chocolate ganache to hold things together. Now here’s where I have issues with Martha Stewart. Her caramel directions are way off and reheating caramel is likely to burn it. I made mine in two batches to minimize “reheating.” I made my first batch in a small pan and poured “windows” on a silpat mat. I made a second batch in a large stainless frying pan with a flat bottom and used that for assembling the chocolate gingerbread house. If you make caramel in a large pan so you can dip pieces in (that works well), then you REALLY have to watch it because it darkens (burns) quickly. As soon as it turns light amber watch carefully. I turned my heat off when mine was light caramel colored and let the heat in my pan darken it a little more. I dipped the house sides into the caramel and held them together to construct the bottom of my house. I did the same with the chimney. I used a pastry brush to paint caramel in two strips on back of my roof pieces before placing them on top of the house (Martha’s roof method does not work). I brushed more on the roof ridge to further stabilize the roof. If you need to reheat your caramel, use the LOWEST setting and watch it carefully. The rest of the decorations on my chocolate gingerbread house are made with chocolate ganache and candy. I spooned white chocolate ganache on the roof and let it slide down to get a snowy look. The ganache stays soft for quite a while and it’s very forgiving so even young children can decorate the roof. I used chocolate ganache to hold my trees together. I made a cone shape with the cooled ganache and then pressed the candies into it. Cover works surface with wax paper or parchment paper and sprinkle surface with cocoa powder. Roll out cookie dough to 1/4 - 3/8" thick. Use cookie cutters to cut out pieces or use a template. Bake pieces on parchment-lined cookie sheets at 375°F for 15 minutes. Cool on cookie sheet. Mix ¾ cup sugar, 2 tablespoons corn syrup and 2 tablespoons water in a small pan (I used a saucepan). Heat on high until the mixture boils. Watch carefully. When the mixture turns medium amber, take the pan off the heat and spoon enough caramel onto a silpat or parchment sheet to cover the area of the window (it doesn't have to fit exactly). When the caramel is cool, use icing to attach it to the inside of the window. Use gel icing and Nerds to outline the windows. Cut the curved end of a pixie Stix filled candy cane to fit around the door. 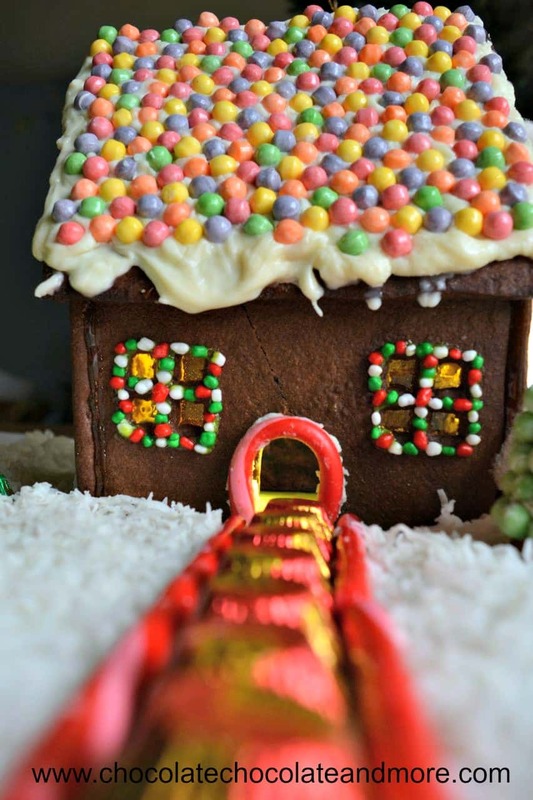 Attach the candy can arch to the doorway with icing. (I let these pieces harden over night so I wouldn't knock candies off in the dipping process). Use remaining ingredients to make a second batch of caramel in a large flat pan. Watch this VERY carefully because the layer is thin and when it starts changing color, it can change fast. When you reach the light caramel color, turn off the heat and let the heat from the pan finish the cooking. Lay a sheet of parchment paper on top of a baking sheet (or piece of wood). You will construct your house on this parchment. Dip the left side of the front of the house in the hot sugar and quickly attach it to the side. Repeat with the right side of the back of the house. Let cool. To attach the last side, hold it at a 45° angle and dip the back side of it in the caramel (I dragged mine a little on the bottom of the pan to get extra caramel so the caramel covered about 3/4 of an inch on the back side). Repeat with the other side and press against the front and back of the house. You should now have the bottom of the house pieced together. Carefully dip the sides of the chimney pieces in the caramel and piece them together (just like the bottom of the house). Lay a roof piece bottom side up. Use a pastry brush to brush wide strips of caramel about 1 inch from each side (not top and bottom but sides). Quickly place the roof piece on top of the house so the caramel is in contact with the sides. Hold in place until set. Then repeat with the other side. I brushed some of the remaining caramel on the roof peak for added stability. Dip the slanted end of the chimney into the caramel and attach it to the roof. Make the white chocolate ganache. Put the white chocolate chips and cream in a bowl and microwave at 30 second intervals, stirring between each one, until the chocolate is melted and smooth. Put 1/3 of the ganache in the refrigerator till stiff but not too hard (if your kitchen is as cold as mine, it can probably stiffen up in your kitchen). If necessary, use additional cream to thin the remaining ganache to a very thick glaze (it should slowly slide down the roof when you spoon it on). Spoon a little ganache on top of the chimney. Generously spoon ganache onto the roof. While it is still warm, press SweeTARTS Mini Chewy Tangy Candy into the ganache. Do this until the roof is entirely covered with SweeTARTS (I did one side of the roof at a time and I did the top half and then the bottom half of the roof). The cooled white chocolate ganache should be moldable. If it is not, you can heat it gently and add more cream (sometimes, it just needs to be a little warm). Mold the white chocolate ganache into a cone (about 2 inches wide at the base and 3 inches tall). Set on a small piece of parchment paper. Press SweeTARTS Mini Chewy candies into the ganache to form the base of the tree. Refrigerate until hardened. Peel away the parchment from the bottom. Place on an unwrapped Butterfinger peanut butter cup mini. Make the dark chocolate ganache. Put the semi-sweet chips and heavy cream in a microwave safe bowl. Microwave at 30 second intervals, stirring between each one, until just melted and smooth. Cool until moldable. Make a large cone out of the ganache. Make a circle out of 9 Butterfinger peanut butter cup minis. Put three or four Butterfinger peanut butter cup minis inside the circle to fill it in. Place the chocolate ganache cone on top of the circle of Butterfinger peanut butter cup minis. Mine didn't attach to all the outer ones but that's OK. Starting at the bottom, press unwrapped Butterfinger peanut butter cup minis into the ganache in rows. You want to have the pointy ends sticking out to make branches. My next two rows had 7 candies, then the next two had 5 candies, then a row of 4 candies, then 3 and then 1 on top. If you run out of ganache, you can add some frosting to the top rows as those candies are more tightly packed. Refrigerate until solid. I made garland from the SweeTARTS Soft and Chewy Ropes. I cut my ropes in half lengthwise and then twisted them together to get the pretty design. I used my sugar canister and several other heavy items to hold the ends together long enough for them to "set." When my tree was ready to decorate, I used flat toothpicks to attach my garland. I pierced the top of each strand with a tooth pick and then inserted the toothpicks into the tree. I tried to insert the toothpicks between candies (into the ganache) as much as possible. I broke off the ends of the toothpicks after the garland was secure. I dipped SweeTARTS Mini Chewy Tangy Candies into some of my white chocolate ganache and attached those around my tree as "balls". I used a large pancake turner to transfer my tree to the front of my gingerbread house. Most of the Butterfinger peanut butter cup minis stayed on the plate so I just put them back around the bottom after I positioned my tree where I wanted. Use mini reindeer cutters to cut out shaped out of the remaining cookie dough (I rolled mine out to ¼ inch thick for these). Cut small rectangles of the dough to serve as bases and bake at 350°F for 10 minutes. Let cool. Put a dot of gel icing for the eye and use a small green Frosty Nerds candy for the eye. You can also put a drop of gel icing on the nose area and attach a small red Frosty Nerds candy for a red nose. Cover the base with buttercream or white chocolate ganache. Sit the reindeer on the ganache. Set the house on a large board or tray that is covered in parchment paper. Make a pathway from the door to the edge of the parchment with red Butterfinger peanut butter cup minis. Break the curved ends off Pixy Stix Filled Candy Canes and arrange those on either side of the path. Arrange the trees and reindeer around your house. Sprinkle coconut around the house to mimic snow. Enjoy! This is a sponsored conversation written by me on behalf of Nestlé Butterfinger & SweeTARTS. The opinions and text are all mine. What a great looking YUMMY Gingerbread house! That gingerbread house is super cute and I love it that it is chocolate gingerbread!!! Thanks Kim! I think I like the chocolate better than gingerbread too.